Injekt engine was used for the development of many advertising-supported programs, and Innovate Direct is one of them. This adware has a unique name; however, it is identical to Elements Peruse, Pop Bubbles, Search Window, Bronze Aid, and many other suspicious programs. It is not difficult to realize that these programs are identical because even their websites are laid out in the same way. What is more, they are dysfunctional because they do not provide installers. 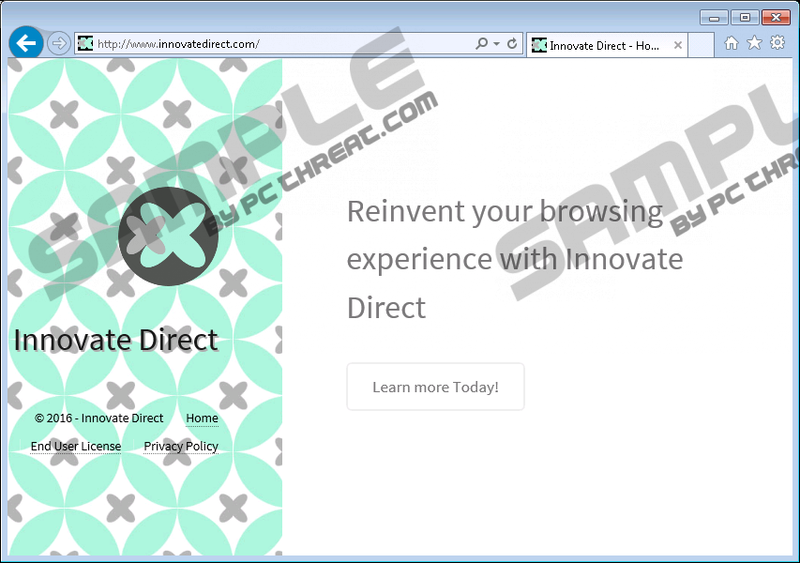 Due to this, we are sure that you did not install this adware from innovatedirect.com. Unfortunately, you might have acquired it along with other undesirable programs, and that might mean trouble. If your Windows operating system was infected with malicious threats when installing the ad-supported program, you might be facing different kinds of security issues. Of course, we suggest removing Innovate Direct before taking care of all other threats. We classify Innovate Direct as an advertising-supported program because it showcases ads as soon as you install it onto your computer. It is installed as an extension on Firefox; however, it shows ads on Chrome and Internet Explorer browsers using the files installed under %Program Files% or %Program Files(x86)%. You can find these files in a folder named after the program itself, so it will not be difficult for you to locate them. According to our researchers, some components of this adware can be found in the %Temp% directory as well. Besides the files, this adware is also controlled with the help of registry keys. Although this program does not hook deep into the system, you cannot delete it with a click of a button. Do you understand why we are discussing the removal of this program? The main reason to eliminate this program from your PC is to evade the potentially unreliable ads. All kinds of advertisements might be introduced to you while Innovate Direct is running. This adware can showcase pop-ups, banners ads, as well as interstitial ads promoting allegedly reliable shopping deals, surveys, and other attractive offers. Keep in mind that these offers belong to unfamiliar advertisers that the developer of adware works with. It might be difficult to learn anything about these advertisers, which is why most users are unsure whether or not the ads shown are trustworthy. We are sure that some of these ads will be harmless; however, you might also encounter useless, traffic-boosting ads, as well as ads promoting unreliable sites, installers, and even scams. Because a risk of interacting with malicious ads exists, we do not recommend trusting Innovate Direct at all. What we recommend is deleting this advertising-supported program from your operating system. As you know, third-party programs are likely to travel packaged with Innovate Direct. These programs might cause more troubles that the adware itself, and you need to take them seriously. If you ignore these programs, you might become a victim of identity theft, your operating system could be corrupted, and more malicious threats could be infiltrated without your permission. Hopefully, your PC is infected with ad-supported programs and PUPs that are easy to delete. Of course, you do not need to panic if you find much more malicious infections installed on your operating system because you can easily install anti-malware software to eliminate them from your computer. Needless to say, if the unreliable ads shown to you have been used to scam you, an anti-malware tool will not solve your problems. If you have scanned your operating system and you are sure that you can eliminate the threats found manually, we suggest starting with the removal of Innovate Direct. The instructions below will guide you through this straightforward operation. Once you uninstall the unwanted program, make sure you check your Firefox browser to see if an unwanted extension exists. If it exists, delete it as well. The manual removal option is great in this situation; however, this leaves your operating system just as vulnerable as prior to the infiltration of adware. Reliable anti-malware software provides malware removal and Windows protection services, which is why it is our first choice. Should you proceed manually, do not forget about your Windows protection, and install reliable security software. Click the Start menu icon on the Taskbar and open Control Panel. Select the application you wish to eliminate and click Remove. Navigate to the left of the Taskbar and click the Windows logo. Open Control Panel and navigate to Uninstall a program. Right-click the program you want to eliminate and choose Uninstall. Launch RUN (Win+R), enter Control Panel, and click OK.
Move to the Uninstall a program menu. Right-click the unwanted program and select Uninstall to eliminate it. Navigate to the Extensions menu. Click the Remove button next to the unwanted extension. Quick & tested solution for Innovate Direct removal.